This line from Luke 13:22-30 always stuck with me: "For behold, some are last who will be first, and some are first who will be last." Have you ever heard about Derek Redmond? No? How about his father Jim Redmond? No? Well let me tell you their story. 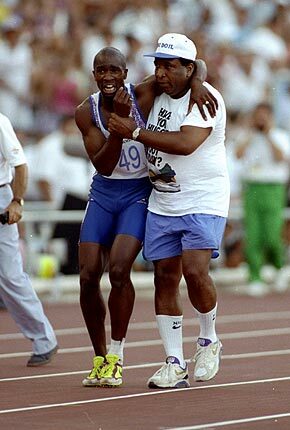 Derek Redmond was an amazing runner. At 19 he shattered the British record for the 400m. Everyone who saw him, knew that he was destined for greatness as a runner. But he was also plagued with a series of injuries that he struggled with his whole career. In 1988, at the Seoul Olympic games only 90 second before the race was supposed to begin, he had to pull out because of an injured Achilles. The experience haunted him. For the next four years, his missed opportunity gnawed at him. During his surgeries, his recoveries, his training - the idea of another chance was his constant companion – driving him to push himself harder so he would be ready. Ready for Barcelona and for his chance to prove that he was one of the world’s best, an Olympian. And Derek seemed to be right on track. and personally broke two British 400m records and this was all before Barcelona! Finally, in 1992 at Barcelona, Derek finally had his chance at the 400m. Earlier he and his Dad had talked about their long journey together and before they parted, Derek had make up his mind that no matter what happened – he was going to finish. It all started well. Derek won his first two heats and just needed to make it through the semi-finals and he would be in the finals! In this semi-final race, he has a great start and surges past the other runners. Suddenly, with only 175 meters left, Derek hears a pop and feels a blaze of pain. In a later interview, Derek recalls that he thought he had been shot! What really happened was that his right hamstring had torn. Derek quickly slows down and kneels down as the other racers pass him. Derek recalled in the same interview, "Everything I had worked for was finished. I hated everybody. I hated the world. I hated hamstrings. I hated it all. I felt so bitter that I was injured again. I told myself I had to finish. I kept hopping round. Then, with 100 meter to go, I felt a hand on my shoulder. It was my old man." Somehow, Jim made it on the track and was able to get to his son and put his arms around him to support him and telling him, “You don’t have to finish. You can stop.” But Derek told him that he had to finish and Jim agreed, "We'll finish together." As they approached the finish line, Jim waved the officials away and let Derek finish the last few steps and cross the finish line by himself before throwing his arms around him again. Meanwhile, when the 65,000 people who were watching realized that Derek was not going to give up, they leaped to their feet and roared their encouragement. People all around the world watching on TV, began to clap and yell at their TV to give their encouragement. Derek didn't fully realize what he had done until much later. After all, he had come in last – putting in the slowest time in the history of the 400m and he was disqualified on top of that because he father had helped him and the Olympics ruled that he did not finish. It was only later, in the coverage by the news and the replays and commentary, that Derek started to realize that his will to finish had become THE story overshadowing even those that had won the race. Derek never won his Olympic medal in the 400m but he has gone on to other sporting victories and become a motivational speaker encouraging others from his own experience. And he and his Dad are still close. And so what does this mean for us? I think that there are many lessons for us when we think about Derek’s race and about our own. First, our own journey is not going to be easy. Christ tells us that those who would be his disciples must pick up their cross and follow him. That means we will suffer and it will be difficult. Life is hard, discipleship is difficult – Christ does not promise us an easy route, he promises it will be hard but we can make it with his help. Second, while we may have to struggle, it is better to have our family and friends help us along our journey. Like the way Jim helped Derek, our brothers and sisters can’t run our journey for us but they can help support us and we should accept their help. Third, we may not hear them but we are not alone as we run our race. Our entire church, including the Church Triumphant, all the angels and Saints, are shouting their encouragement and praying for our success. As the Bible says all of heaven rejoices when a soul is saved. No matter that we fall down, no matter our missteps or how slow we go down the track – uncountable souls rejoice every time we pick ourselves up and continue to hobble towards the finish line. Finally, it doesn’t matter what order you finish – just finish right. Our world tells us that being first is all that matters. Win at any cost. But that’s not what God tells us. God does not see us the way that the world sees us and does not value us like the world values us. The world says you only have value for what you can do, God says you have value just by being you. The Bible says what good is the whole world if you lose your soul? Because we live in the world, it is easy to fall into the trap of measuring yourself to the world's standards - wealth, fame, power, prestige. And if we do then it is easy to compromise ourselves in order to win at any cost. But none of these things matter to the Lord. The only thing that matters is your soul. God does not care about full hands - only clean hands. And my hope is that we will finish. When we finally hobble across the finish line, I hope that we will see each other and all those who have been encouraging us. Shouting with joy for us because we made it. And in finishing, we will be first. That is a beautiful prayer, that we all finish together. Ending up with our Lord for eternity. Now that is something that is worth a struggle. Thanks Tami - looking forward to finishing with you and yours too!